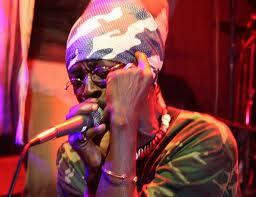 Dancehall Reggae singer General Smiley - Dancehall Reggae singer general smiley. Smiley is part of the first reggae duo Papa Michigan and Smiley. General Smiley who's real name is ERROLL Bennett got the name while he was going to school because he almost never ever smiles. He began his career in the late 70s at Studio One. Under the direction of the late Sir Coxsone Dodd one of the best record producer the industry have ever seen. Smiley's first hit song was "Rub a Dub Style" which was released in 1979, this was a collaborations with Papa Michigan, this was followed by "Nice Up the Dance.". One of his latest single Natty Natty has being very google internationally. Michigan and Smiley still get Together for performances though they both are involve in their respective Projects within the realms of the music.